There was a another very interesting meeting at GWAC yesterday evening. GWAC Secretary Susan Briggs reported on correspondence with Strathcona Residents Assoc (SRA) and others regarding noise from the railways crossing our neighbourhoods. This has to do with the expansion of the Port of Vancouver. SRA seeks to have the project subject to the Provincial Environmental; Assessment process which is more stringent than the Federal process. So far, the Provincial government’s position is that this is Federal jurisdiction and they have no power to intervene. GWAC will continue to monitor this issue. Susan also reported on the growing number of GW lots being swept up in real estate/development assemblies, and complaints that GWAC has received from residents across the district. This led to a vigorous discussion about the City’s Rate of Change policy and its failure to protect the vast pool of affordable rental suites in GW’s so-called “single family housing”. There was also a discussion about the proposed housing project at 1st and Clark. It was agreed that the project should at the very least reflect the scale of surrounding buildings. The second half of the meeting was a presentation by Executive Director Cynthia Low of the Britannia Community Services Centre. She announced the public unveiling of the outside consultants’ Britannia Renewal Master Plan at an Open House this coming Saturday. Two of the major issues still not determined are the type and number — if any — of housing on the Britannia site (something on which the City is insistent), and whether there should be one or two ice rinks. The previous Open House had presented three concepts for renewing the site. The consultants have taken the public comments on each concept and will present a single idea this weekend, including massing and phasing plans. Cynthia also announced that the Britannia Board will present its own response to the Master Plan, noting that the Board is just one of the partners in the project — along with the City, the School Board, the Library Board, and the Parks Board — each of whim has their own agendas and priorities. The Board wants to make sure that whatever changes come to Britannia, the site’s historic and highly successful inclusive and welcoming atmosphere is not damaged by new additions. This was a very useful meeting, full of interesting and usable information. It showed how well GWAC can be a forum for neighbourhood discussion, and a dispersal point for information. It was particularly good to see new members coming to their first meeting and participating actively. 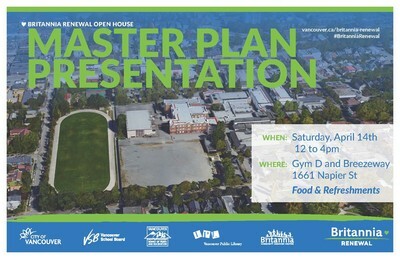 The next in a long series of Open Houses regarding the future of the Britannia Community site takes places this Saturday, 14th April, between noon and 4pm in Gym D.
This is an important meeting as it will coincide with the public release of the draft Master Plan for this most vital part of our community, which currently includes two schools, a library, several gyms, a swimming pool, an ice rink, a seniors’ centre, offices, and green space. If you attended the last Open House about a month or so ago, you may recall that three different concepts were presented for the future of the site. The consultants have apparently taken the public comments from that display and will be presenting a single concept design. Withe the publication of the Master Plan we are moving quickly to the end of this phase of the re-development. Several major issues — what kind, if any, of housing should be on the site, whether there should be one or two ice rinks, for example — still have to be ironed out, but these will be settled soon, and the project will move on next to rezoning and final consultations with the City, the School Board, Parks Board, and Library Board. It is hard to express just how important Britannia is to the Grandview Woodland neighbourhood and I urge you to take a few minutes on Saturday afternoon to review these plans and make sure your views are known. You are currently browsing the Jak's View of Vancouver v.3 blog archives for the day Tuesday, April 10th, 2018.